Plantar fasciitis can be extremely painful to live with, especially when not many boots are comfortable, supportive or stylish. For one thing, unsupportive boots tend to strain the ligament in your foot that supports the arch of your foot. To make matters worse, continued strain from standing, walking and running can cause this ligament to swell and become irritated; which further, produces your foot pain. With this in mind, if you searched for boots for plantar fasciitis and landed here, you are on the right track! You are aware how critical it is to find best boots or any other footwear that supports your foot condition without causing further pain. We know that most unsupportive shoes or boots worsen the pain you’re already experiencing. Not to mention, many of our customers just like you have experienced pain caused by plantar fasciitis for not wearing supportive footwear. For this reason, we have compiled a list of Best Fall Boots for Plantar Fasciitis based on customer reviews, shoe features, and brand reputation. This Bianka bootie offers optimal comfort with an excellent fit. It is good plantar fasciitis boot for its removable insole with integrated Soft-Air Technology helps to absorb impacts and ensures a healthy environment inside the shoe. Thanks to its removable insoles, it allows those who require additional support from custom orthotics. In addition, this bootie’s modest heel height is very comfortable to wear thanks to the cushioning at the forefoot of the shoe. Plus, it offers an easy on and off all thanks to its side zipper. Overall, Bianka is a perfect choice for our fall boots for plantar fasciitis choices. 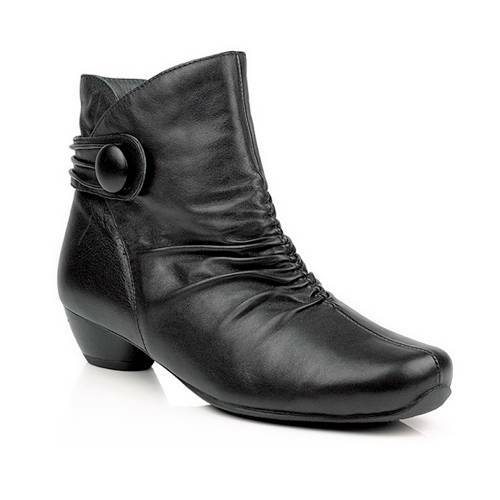 This Mephisto Batista Velcalf ankle bootie offers optimal comfort with an excellent fit in a cute, stylish design. This bootie’s insole is integrated with Mephisto’s Soft-Air Technology as it helps to absorb impact and ensures a healthy environment inside the shoe. In addition, Batista’s insole is removable so it’s great for plantar fasciitis and those who require additional arch support from custom orthotics or over the counter insoles. Finally, its modest heel height is very comfortable to wear thanks to its cushioning at the forefoot of the shoe, plus, it’s this bootie can we worn with most outfits. Overall, Mephisto Batista’s superior quality and excellent arch support earn its spot in the fall boots for plantar fasciitis. Comfort meets fashion with this Ziera Canny. This Ziera Canny is great for bunions, fallen arches, and plantar fasciitis. If you are looking for wide width boots, this may be your boot! Ziera Canny boot for plantar fasciitis come in medium width and wide width. Most importantly, its footbed is designed to incorporate Poron rubber, Technogel and EVA for ultimate support and comfort. Plus, the bootie’s cushioning in the ball of the foot keeps your feet comfortable. Not to mention, this mid-heel ankle boot has a side button with a loop and ruching on top of the foot makes this boot stand out.You can walk in style and confidence in this gorgeous wedge heel design and feel all-day comfort in these cute boots for plantar fasciitis! Let’s not forget the ultimate weather-proof boot! The Aetrex Short Lace-up Blackberry is fully lined with ultra-soft faux fur and water-resistant neoprene makes the ultimate plantar fasciitis weather-proof boot. This is a great boot for plantar fasciitis for its Aetrex “Healthy 3“: Lynco arch support, Memory Foam, and Aegis Antimicrobial Technology. The boot’s Lynco Arch Support aligns with the optimal position to properly balance your foot. Its Memory Foam features a thick layer of slow recovery memory foam that customizes to your feet, for the ultimate footwear experience. Not to mention, it’s Aegis Antimicrobial Technology makes it easy to maintain a clean and healthy environment for your feet. Aegis helps prevent the growth of bacteria and fungi and helps keep your feet odor free. Overall, this Aetrex Short-Lace-up provides unmatched support and improves how your body functions from the ground up. Not only are these Aetrex Short Lace-up boots warm but are also extremely supportive boots for plantar fasciitis. This Luana Wedge Bootie is made of a comfortable and flexible lytech material (microfiber cloth) which makes them very lightweight! It is flexible, lightweight and even provides arch support so it’s great for bunions, hammer toes, and plantar fasciitis. 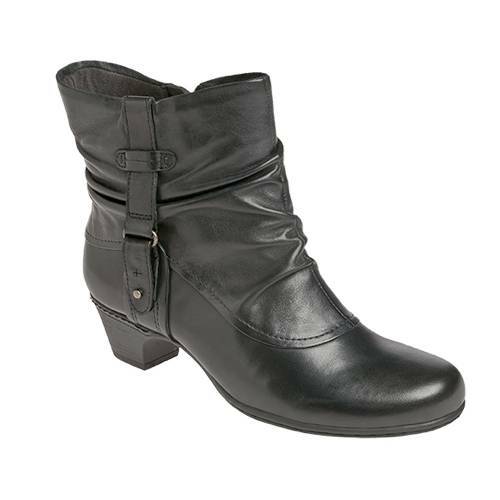 This bootie is comfortable to wear, plus, this style has an inside zipper for easy on and off. This Luana is definitely a must have this fall and year-round wear. Not only is this Vionic bootie cute, but it is also packed with the full features many have grown to love in Vionic shoes. This cute boot for plantar fasciitis offers advanced comfort features like a deep heel cup and enhanced forefoot contour, bringing innovation and style into one transformative solution. Not to mention, Faros’ removable microfiber-covered EVA orthotic insert is firm yet flexible, which accommodate most orthotics. This stylish low-heel boot wraps your feet in ruching and vintage style. This cute Cobb Hill Alexandra is a round-toe boot with ridged heel featuring ruched shaft and decorative strap with peg-and-notch closure. Not to mention, its EVA foam footbed massages the foot with each and every step. Plus, its stacked heel with rubber outsole delivers long-lasting durability and comfort. Finally, this boot is made of sumptuous leather with a burnished finish and antiqued buckle detail which makes them the go-to boots that go with anything, from jeans to a skirt. This is a military boot that elevates the classic lace-up boot style with quality leathers and a sleek design. This is a great plantar fasciitis boot for its Aetrex “Healthy 3“: Lynco arch support, Memory Foam, and Aegis Antimicrobial Technology. The boot’s Lynco Arch Support aligns with the optimal position to properly balance your foot. Its Memory Foam features a thick layer of slow recovery memory foam that customizes to your feet, for the ultimate footwear experience. Not to mention, its Aegis Antimicrobial Technology makes it easy to maintain a clean and healthy environment for your feet. Aegis helps prevent the growth of bacteria and fungi and helps keep your feet odor free. In addition, it’s easy to maintain a clean and healthy environment for your feet. Overall, the Skyler boots are good boots for plantar fasciitis for their excellent arch support, memory foam insole, and rubber outsoles. This Aetrex Autumn is a great plantar fasciitis boot as it’s expertly crafted with Aetrex “Healthy 3“ featuring lasting comfort. Its Lynco Arch support aligns with an optimal position to properly balance your foot. This boot provides unmatched support and improves how your body functions from the ground up. In addition, its Memory Foam Cushioning features a thick layer of slow recovery memory foam that customizes to your feet, for the ultimate footwear experience. This is a gorgeous teal boot that is not only stylish but comfortable! This Cobb Hill Keara is both comfortable and supportive, offering a full-length molded EVA foam insole which adds stability to your walk. Not to mention, the boot’s a cushioning foam footbed molds for a personalized fit. Plus, its full-length insole is also removable which allows you to use your own custom insoles or orthotics. In addition, this lace-up and zipper closure in front helps secure your feet and ankle. Finally, its durable outsole delivers stability and shock absorption. What you should be looking for when shopping Boots for Plantar Fasciitis. Ideal plantar fasciitis shoes should keep you supported through your busy day. Therefore, they should offer you arch support to keep your feet from flattening out and help limit pronation. Finally, good plantar fasciitis shoes should help minimize or absorb harmful shock from the ground up. Good shock absorbing shoes are made with thick rubber outsoles for shock-absorption and traction. If you prefer to try-on boots for plantar fasciitis, we have nine Lucky Feet Shoes comfort shoe stores in Southern California. Which are located in Costa Mesa, Anaheim Hills, Rancho Cucamonga, Riverside, San Dimas, Long Beach, Temecula, La Quinta, and Palm Desert. Therefore, we invite you to stop by for a free foot analysis and try on our top boots for plantar fasciitis. In addition, we have a large selection of comfort shoes, wide shoes, arch support, and custom orthodotics! We carry many comfortable plantar fasciitis boots and shoes: sandals, heels, walking shoes, running shoes, casual sneakers, clogs, wedges, flats, booties, and boots. Finally, we encourage you to shop in-store for our personalized customer service and free foot analysis! If you have ever experienced pain in your feet and believe you be a suffering from plantar fasciitis, allow us to help you find the best solution to help you get back on your feet, pain-free. Don’t let plantar fasciitis keep you from enjoying your life! We offer footwear to help eliminate plantar fasciitis foot pain. In addition, we offer a Free Foot Analysis to all of our customers. Schedule a free foot analysis today!